King Wraith comes from Italy, but they sound like they should be from a country farther north. 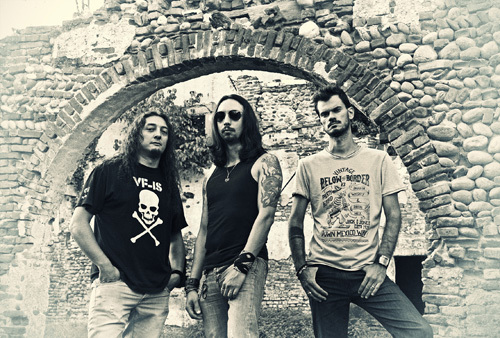 Taking their cues from bands like Running Wild and early Blind Guardian, these Italian metalheads sound more like a German power metal band. The arrive with their first album, Of Secrets And Lore. It's probably not necessary to tag King Wraith by country. Listening to the music, their style of power metal is essentially rooted in its early tradition: taking melodic heavy metal and adding speed. And they do it as a power trio. There's an abundance of brisk riffage and bristling solos, powered by a galloping rhythm section. Guitarist Daniele Genugu also provides the vocals, being melodic yet adding some depth and drama in his tone. When combined with his band mates, the drama is increased from a choral effect. As an instrumentalist, Genugu is no slouch either, offering epic guitar solos. So most everything here is speedy. The songs leap from the proverbial gate and don't really slow down. There may be a brief gentle start to a song like at the beginning of Poseidon, after which the race is on. Yet tempos can moderate. 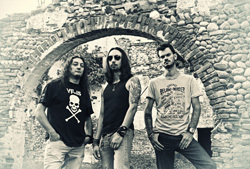 Iliad is a more traditional metal song with a deliberate and steady pace. So also is Evil and Skulls, which cross boundaries between heavy and epic doom metal, without sounding plodding as the latter genre can often be. Then for something completely different, there's the title cut. It's not heavy metal, speed metal, or power metal. It's largely acoustic guitar paired with a vocal arrangement having that aforementioned choral effect. Basically, King Wraith's Of Secrets And Lore is straight up and solid classic old school power metal. If that's your thing, you're going to love this album. 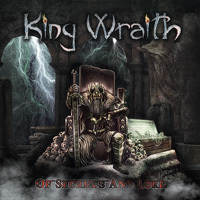 Basically, King Wraith's Of Secrets And Lore is straight up and solid classic old school power metal. If that's your thing, you're going to love this album.